I’d like to open with a small update from my review of the Leatherman Charge TTi. In the conclusion, I stated that even though it was too large to carry, I’d hold onto it because it was handy, well made, and could always be tossed into a bag if needed. I’ve since sold it, perjuring myself in the process. While the complaints in the review were a factor in that decision, the primary reason was that I already had a multitool that handled all my needs: the Leatherman Skeletool CX. Mind, the Skeletool isn’t a new design. It debuted in 2007, and judging from the number of variations that have been released, it’s sold well. Tony of Everyday Commentary published a review of it back in 2011. You might be asking yourself why a review of a decade old design is warranted. The simple answer? I moved (for the second time this year) a few months back, and in so doing carried the Skeletool so often I thought it deserved the attention. The Skeletool CX measures in at a closed length of 4 inches and a weight of 5.08 ounces. While those numbers might not sound noteworthy at first glance, bear in mind that most full size multitools weigh upwards of 8 ounces. Most of these weight savings can be attributed to the tool selection (which we’ll talk about farther down), but the skeletonized, asymmetrical frame is also partially responsible. In addition to lowering the weight, the handle design is ergonomically impeccable, regardless of which tool is being used. The pliers on the Skeletool are well made and suited to a variety of tasks. I’ve used them for everything from splinter removal to furniture assembly. If I had my druthers, the jaws would come to a finer point like on the wave and charge models. There’s room in the frame, and pliers this size will be used as needlenose more often than not. I can’t rightly say that the pliers have ever been too thick, so take that criticism with a grain of salt. I haven’t had occasion to use the wire cutters yet. More than one online review notes that the pliers are prone to breaking, although my own experiences don’t back those claims up. One memory in particular stands out: I had locked myself out of the company vehicle, and was trying to use some thick wire to unlock the car door. Lacking any sort of a pry bar, I jammed the pliers into the seam between door and frame and leaned in, creating a gap wide enough to slip the wire through. I failed to unlock the door, but the Skeletool shrugged off the abuse. In the event that the pliers do break, Leatherman’s 25 year warranty will make it right. Compared to a full-sized multitool, this list might look a tad anemic. I can’t blame anyone who has that reaction; I did as well. Even after owning the Skeletool for years, I thought it lacked in a few areas. That was actually how I justified purchasing the Charge TTi. Over time, I found that even with the Charge available, I reached for the Skeletool, even for heavy-duty tasks. My reasoning was simple: whenever I needed something more capable or specialized than the Skeletool, I just needed an actual tool, not a bigger multitool. Furthermore, the Skeletool is only focused on doing a few things, and because of that it can do those things far better than a less focused tool. The best example of this is the Skeletool CX’s blade. It’s made of 154CM (one of my favorite blade steels) and has a modified drop point (one of my favorite blade shapes). There’s plenty of belly for slicing cuts, but not so dramatic a belly that it slips out of material during push cuts. The .10” thick stock is taken down to a serviceable edge by a flat grind. It’s not something you’d reach for in the kitchen, but it works just fine for preparing a picnic lunch. The previously mentioned ergonomics are at their best here, as the humped spine of the blade and the curve of the handle produce a grip rivalled only by Spyderco’s famed ergonomics. Instead of making each driver its own tool, the designers of the Skeletool put a bit driver in the tail end of one of the handles, and a slot for an extra bit in the other handle. It’s a clever way to maximize the utility of the Skeletool using the minimum amount of space. There’s no lock to worry about, as the bit driver doesn’t fold into the handle, and the tapered handle lets it fit into nooks that’d refuse a full-size multitool. As an added bonus, the Skeletool is fully compatible with the Leatherman Bit Kit and Bit Extender, should you need more options or reach. The tool set is rounded out by a bottle opener that doubles as a carabiner. I’d like to say that this is the least used tool, but that’d be a lie. Suffice to say that I’ve put this particular implement through extensive testing. It lifts the cap off with a single pull, every time. What truly sets the Skeletool CX apart from every other multitool on the market is that it carries like a modern pocket knife. Most multitools are designed to be carried on a belt or in a bag, with the option (however ill-recommended) of carrying it with a pocket clip. That isn’t the case here. The Skeletool was designed from the ground up for pocket carry, and the end result is a multitool that you don’t need to force yourself to carry. Consider this: it’s less than an ounce heavier than my ZT0900, yet has a blade just as long, pliers, a bit driver, and a bottle opener. On the whole, I’m impressed by the Skeletool’s fit and finish. The plier jaws mate perfectly, the blade locks up rock solid, and there are no odd rattling sounds or loose tools. One feature that I particularly admire is the slipjoint system built into the frame. It acts similarly to a half stop on a traditional knife, granting the plier jaws and the frame a bias towards closure, as well as a reasonably crisp ‘detente’ that needs to be overcome. However, the Skeletool isn’t without issues, and most of them are related to the blade. It’s off-center to the extent that it rubs against the handle, the grind is choppy at best, and the tang is just sharp enough to scrape your hand if you have to reach past it for something in your pockets. None of these issues are deal breakers for me. Only one of them (the aggressive tang) impacts the function of the tool, and even then it’s more of an annoyance than a failure. To sum up, the Skeletool CX is such a good piece of gear that it makes most of my knife collection look frivolous. The few complaints I have are negligible when weighed against the utility of the design. It isn’t as fun as a framelock flipper, and it doesn’t have have the charm of a traditional pocketknife, but if I was relentlessly practical, I’d carry the Skeletool six days out of seven. How does it stack up to the competition? Well, there are cheaper options. The Leatherman Wingman comes in at less than half the price of the Skeletool CX, but is significantly heavier and made from cheaper materials. I can say from personal experience that the Leatherman Charge TTi (though it boasts more features and better materials) isn’t useful enough to justify the increase in cost, let alone weight. If you’re on a tight budget, the plain Skeletool is a fine option. It’s the exact same design, but with a half-serrated blade made of much cheaper steel. Who would I recommend the Skeletool CX to? Honestly, everyone. It’s nice enough that I wouldn’t want to abuse it, but that’s not what it’s designed for. At the end of the day, a multitool is meant to save you a trip to the toolbox, not replace the toolbox itself. Do yourself (or a gear geek you know) a favor and pick one up. You’ll be surprised at how capable a tool it is. I recommend purchasing the Leatherman Skeletool CX at Amazon or BladeHQ. Please consider that purchasing anything through any of the links on this website helps support BladeReviews.com, and keeps the site going. As always, any and all support is greatly appreciated. Thank you very much. I thought the review was outstanding. There was a brief discussion of other Leatherman tools and I will add to it. I am urban, older, unlikely to “bug out” in an emergency and already have tool sets that are routinely used. I don’t go on 5 day “roughing it”. Yep. I have walked in the Himalayas and on Mt. Hakone in Japan. Doing them again is not on the agenda. Years ago, I had decided that the Wave was the model for me. I do routinely clean my fingernails, remove wood splinters and trim the finger and toe nails. If I have an “emergency” on a day hike, it will most likely relate to the foregoing. So any Leatherman tool without a scissors is useless in my life. In my life, I have been stuck at the Grand Canyon and stuck in Barstow,CA (the desert). They had nothing to do with any purported lack of regular maintenance. So, the Surge is the emergency car tool now. A TSA confiscated unit fills the need. I do travel overseas and knew it would be expensive to carry a Wave in a suitcase only to have it stolen by a federal employee working for TSA. (It took 3 months to recover my Laptop that went missing at the check in scanner of TSA at LAX!). And, I have used the Wave in Europe. So, the TSA obtained Wingman goes into every suitcase instead of a Wave. It’s hard to go wrong with any Leatherman, really. I have a Squirt PS4 on my keyring which gives the aforementioned scissors when I need them. Threw a sale-price Wingman into a fishing tackle box. My Wave is relegated to a “portable toolbox” when I travel, because I’ve needed it *just* often enough for that. And like Grayson, I pull out the Skeletool in lieu of a regular pocket knife any time I have a chance of needing a tool, and it could save me a trip to the workbench. Thanks for adding to the review. I don’t think I’d relish being stuck in Barstow, or anywhere along the Vegas drive for that matter. Scissors -are- helpful, but I can’t exactly trim my toenails at work. One of the food safety guys might take it the wrong way. Definitely useful if you’re out in the boonies, however. And Mike is right: I don’t think you can really go wrong with a Leatherman. Fantastic job here Grayson. One thing I would like to add here is regarding the ergonomics: I’ve always found the D-shaped opening hole just as comfortable, natural, and easy to use as a Spyderhole. My Skeletool predates my first Spyderco by a fair bit, so it wasn’t until I got my hands on a lesser knife with a bad opening hole that I could appreciate just how wonderful this one was. Thanks for the flattery (and for help editing it). I can’t disagree re: the thumb hole. It’s really quite good. Here’s the thing with the Charge: it shines as an in-and-around-home-base convenience tool. I don’t EDC it but I keep it stashed in a kitchen drawer and reach for it instead of my dedicated tool stash, 9 times out of 10, when I need a tool around the house. And I’ll clip it to my jeans when I’m spending a day doing work around the house. It has paid for itself in utility an order of magnitude times over. Just to present another perspective, if one EDCs an Alox Cadet and a good sized, light folding knife such as an Endura, then isn’t the Skeletool the fish out of water? I use drivers and bottle openers all the time, but I rarely need pliers. The Skeletool gives me pliers and little else. For me it’s the Charge that really justifies carrying something beyond a little Victorinox, since it gives me great, tough little scissors; a good saw for notching wood; and a file. I use all of those often around the house. Short version; you better *really* appreciate those pliers to justify the Skeletool over Cadet+a folder. Just presenting another perspective! I liked the review. I bought a Skeletool in 2007 as something for the tackle box, put it in my pocket and it never left until this year. It is the perfect set of tools for my needs and the best blade shape on any Leatherman by far. The reason it left my pocket this year is that the bit driver broke. Leatherman took it back and replaced it. This would have been great if they hadn’t changed to a half serrated blade and if the liner lock wasn’t worn out on the new one. To their credit, I forgot that they had changed the blade and didn’t write on the warranty form that I wanted my blade on the tool that was returned to me. However, I did call them before they looked at my tool and asked them to do so. They did replace the second Skeletool with a much better one, but getting a nonserrated blade was a no go. They wouldn’t even let me buy one because taking the tool apart myself voids the warranty. Now my most used tool is useless to me and I have to put money back to buy a CX if I want a straight edged blade and a warranty. That is a mistake on my part and a complete failure for Leatherman. Always glad to see you in the comments. Apologies for not replying sooner. First off, the little lady and I are apartment dwellers, so there’s very little in the way of repairs that we’re allowed to do, per our rental agreement. Most of the stuff that won’t jeopardize our security deposit can be handled by the Skeletool CX. So as far as an “in-and-around-home-base convenience tool” is concerned, the Skeletool still gets the nod (for me). If you’re a homeowner, or have a different rental agreement, or maybe are just really into do-it-yourself crafts, a larger tool might be up your alley. Second, I’m already in the habit of carrying two knives at work. A modern folder for convenience, and a traditional folder in case the corporate safety folks have a gleam in their eye. Pair that with a Vox/Bond Halo Carabiner (which I use to hold my keys), and I’ve got the hypothetical “Endura/Alox Cadet” carry handled. I take the Skeletool to work when I know that I’ll be pulling water samples that will require a set of pliers (for example, removing the aerators from sink faucets), or when carrying a modern folding knife will get me in trouble with the client (which can happen, especially in the oil industry). So, short version: yup, I really appreciate those pliers. Glad you liked the review! Thanks for taking the time to comment. I’m sorry to hear about your woes; there’s few things more aggravating than losing an oft-used tool, especially when a bit of care on Leatherman’s part could have avoided this result. 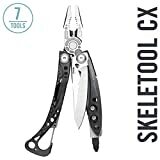 If you want my advice (and I know you didn’t ask) I’d try and send this last one back, and see if they could give you credit towards a Skeletool CX, or even just send you one outright for your trouble. From my perspective, it’s definitely a worthwhile upgrade if within your means, and Leatherman should bear at least part of that cost. I do appreciate the advice and have actually tried. I had asked to speak to the manager of the warranty department on at least three different occasions, but was told that would not be possible. I eventually did speak to someone who transfered me to the manager’s phone, but that call was never answered nor did I receive a call back. I still love Leatherman tools and could not, in good conscience, recommend another brand of multitool to anyone. As a side note, I can’t recommend any of the Swiss Tools because I have no experience with them. I just wanted to share my experience so that others who may need to go through the Leatherman warranty process are aware that they should look for design changes and fill out the paperwork with any requests before sending their tool in. Good review. I just got mine today after reading countless reviews on how good it is. It did not disappoint. I got it for a blade that can pass Thailand customs, for some reason the police in Thailand will bust tourists who carry weapons while their citizens have crazy amounts of guns and blades. Multi tools seem to fly under the radar though. Go figure. I’m a bladesmith so the steel was important which is why I went with the CX. It took about two minutes to hone the blade to shaving sharp. I’m impressed so far. Glad you enjoyed the review and are enjoying your new Skeletool. It’s a nice compact multi-tool for sure. Hope yours gives you many years of enjoyment. Have fun in Thailand!